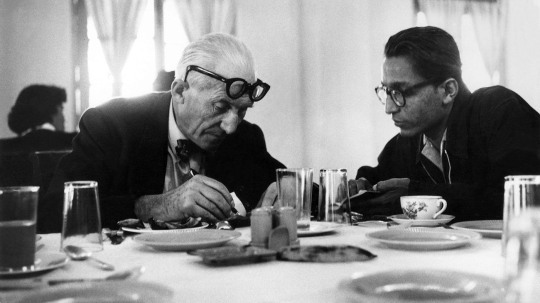 On Friday evening, here in Toronto at the Aka Khan Museum, this year’s Pritzker Architecture Prize was awarded to Indian architect, Balkrishna Doshi. He is 90 and will receive US$100,000, as well as the honor of being the first Indian to receive architecture’s Nobel Prize. This year was also the first year it was awarded in Canada. Alex Bozikovic of the Globe and Mail sat down with Doshi while he was in Toronto. Article here. Doshi also lectured at the Daniels Faculty at the University of Toronto earlier in the week. Some of you will probably recognize the name because of his collaborations with Le Corbusier and Louis Kahn. But as Alex quoted in his article, this year’s prize is about, “expanding the scope of architecture’s usefulness.” Doshi’s architecture is less about objects and more about the public good it creates. For more on Doshi, check here. On a related note, I was happy to see worlds collide in my Instagram feed this morning with this photo from the event. It’s a picture of Jeanne Gang, Meg Graham, and Andre D’Elia of Studio Gang and Superkul, respectively. We are thrilled to be working on projects here Toronto with both firms.